Masti bhara song sung by Sohail Sen featuring Sharad Malhotra, Bidita Bag, Prateek Chakravorty, Evelyn Sharma, Karan Sagoo. Star Cast: Sharad Malhotra, Bidita Bag, Prateek Chakravorty, Evelyn Sharma, Karan Sagoo, Reshmi Ghosh. The video of this song is available on YouTube at the official channel unisysmusic. This video is of 1 minutes 35 seconds duration. 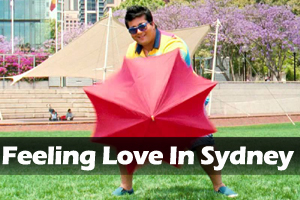 Lyrics of "Feeling Love In Sydney"
Lyrics in Hindi (Unicode) of "फिलिंग लव इन सिडनी"